It was a beautiful summer day here today and I spent the afternoon at the wading pool with my best friend and her boys. It made me wish I could be a kid again. Summers were the best back then! When I was a kid, we used to go to the same place on vacation pretty much every year. Kingsley's Campground at Christina Lake, BC. It was awesome. (Sadly, Kingsley's is no longer.) We usually camped, but there was a sweet little cabin there that we rented a couple of times. Other years we had friends staying in it and still got to hang out there. The bathroom door had an old glass door knob that I thought was the coolest. 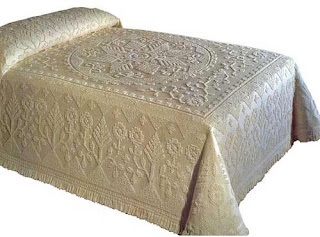 The beds had white chenille bedspreads sort of like the one in the picture. Twenty years later, chenille bedspreads still make me think of that cabin. My summers at Kingsley's were some of the happiest times of my life.